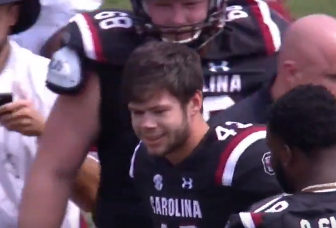 South Carolina Gamecocks walk-on kicker Parker White was awarded with a scholarship in a surprise announcement made during Saturday's spring football game. It happened a few seconds prior to halftime immediately after White kicked a 37-yard field goal. Head coach Will Muschamp stopped the game and told White to look at the scoreboard, where a video tribute of sorts for White was played with the words "Hey, Parker White...you're officially...on scholarship." White's teammates gathered around him and gave him well-deserved congratulations.